I completely missed the LEGC release last May and just happened upon it in a comic store over the weekend. The initial book is set in 1910 and seems to be part of a trilogy that will end in 2008(!?). The first issue (a graphic novel all by itself) started off slow but ended up having an amazing set of plot lines that required an immediate re-read to find the clues early on as to what was going on (and clues to what’s going to happen next). While Black Dossier is fairly inaccessible to those who are not fans of the series, Century is highly recommended. Kevin O’Neill’s art, always a sugary treat, is absolutely top drawer here. Sometimes, no matter how into the wee hours it is, you have to say yes to one more game even if said game takes 3+ hours. 4Th edition Talisman had a very rocky start with an abortive first version, change in publishers and the like, but with the Frostmarch expansion, Fantasy Flight yet again proves that it is not only filling in where the edition is missing compared to 2nd, but continuously improving the game. Having played 2nd edition hundreds of times in my misbegotten youth, I’ve only got ten or so plays with the 4th edition set and fewer still with all the current expansions. Initially I detested 4th edition but bought it anyway (just in case); detested, that is, until the puissant Dungeon expansion hit the shelves: an expansion so far superior to the original I skipped and pranced down the path of advocacy. The first Frostmarch game we got down to featured the Monk, Gypsy and Druid. With years of the Monk’ s standard power under our belt from 2nd Edition, we opted not to run with the erratta in 4th Upgrade that states that the Monk can only add his starting craft to his strength in combat (3 total). The Monk, as normal, became worrisome early in the game. Unluckily, the two toadings during the first game were both burdened upon the Monk and all his horde of belongings were procured by the lucky druid who proceeded to cast down the Frost Queen in short order. Demanding satisfaction, the Gypsy and Monk player requested another game and the wee hours slipped away, and again the next night, and the next. Character death is rare due to fate points— the rerolls allowed from the Fate Points buffer your life stack. Mobility is a premium– the ability to control your movement, either with the magic carpet, clockwork owl (probably the best treasure in the treasure deck) or even the poltergeist is a key ability for your character to have. More Alternate Endings! – The Warlock’s Quest alternate is good fun, but with only the updated Crown of Command and Frost Queen to randomly get at the end of a slough to the center of the middle region, we’ve only gotten a mere taste of the possibilities. That said, my period of abject hatred for 4th edition Talisman is long over. FF has pulled this game out of the doldrums and while I still question the inclusion of fate points, they are starting to grow on me. Fittingly, the first post of a new blog about gaming should be about a game I rarely get to play these days that has, since it’s first expansion, been all-holes-filled with totally awesome: Shadowfist. With the most recent expansion: Empire of Evil, the game gets back to what appears to be a solidly themed, well produced expansion. While Shadowfist has a long and glorious history of rock solid playtesting, some of the thematic decisions in recent expansions have been downright questionable. When they announced their Shirikens and Sixguns expansion I almost choked while spewing forth the word DOOMTOWN, which, sadly by the same author of Shadowfist, did the whole weird west thing to it’s rolling thunderous death. With Empire of Evil, we get straight down to what Shadowfist is about– bands of misfit badasses with good hearts being mercilessly cut down trying to stop the machinations of one of the game’s nasty factions (Lotus, Ascended and Architechs). The cast of characters, in typical fashion, have awesome names the belie their badassiveness: Alabaster King, Jade Willow (pictured), Iron Jim Colson and last but not least, the bomb-crossed lovers: Jayne Insane and Johnny Amok. What amazes me is that this is expansion 13 or so for the game, and, last I checked, it was 2009– over a decade after the CCG explosion rocked the earth to it’s core. Given my original playgroup have all moved away, gone to jail or–well that pretty much covers it–it’s bittersweet to see an expansion come out this especially awesome for a CCG that for all statistics should be long, long dead. What is it exactly that allows Shadowfist to live on, not necessarily thrive, but creep along with new publishers taking up the mantle every few years? First off, it’s the game itself. Shadowfist plays extremely fast, and has very fluid card play rules compared to other CCG’s of it’s day. Essentially, if you have the resources, you can play most cards at any time during the game, whether it’s your turn or not. While turn-angst is still a factor in games with more than three players, a hand full of cards and a few points in power in Shadowfist means you can actively effect the other players actions, so you are always watching the table with that special combination of trepidation and glee that comes from making difficult choices. My original play group back in the late 90’s would play with 5+ players on a regular basis, a testament to Shadowfist’s acceptable turn-angst. What’s more, Shadowfist is very much a social game of bluffing, reading the table and over-all skill. That said, I have read that deck construction is only about half the game, where in other CCG’s, given average luck with the cards, once your deck’s engine gets going it’s engine-to-engine battle and player choices feel exceedingly scripted by the confines of the deck’s card selection. 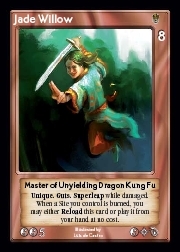 To win a game of Shadowfist, you must win against all the other players, so planning an engine that can deal with all contingencies across the card set is difficult, planning for the gamut of players that will sit behind these decks is a true challenge of skill outside sorting through stacks of cards on your bed. Other elements in the plus column, ‘Fist has no player eliminations (it is possible through some of the crazier cards, but I have only seen it happen a handful of times), so all players lose when one wins. This triggers a nail-biting end game, where each player, if possible, goes for the win against the wishes of the rest of the table while ganging up with the other players when it’s the next guy’s turn. The key skill is to know how much you can expend on defense without weakening your own chance for victory, since if you hold back too much, you could be allowing another player to claim victory. Last, it’s Shadowfist’s fan-base, who, in many cases, have put their money where there mouth is and invested in the game’s future in more ways than just buying the cards. There’s no way possible, however much money is thrown at a game, to get the level of playtesting that Shadowfist has a reputation for without absolutely fanatical players as well. Once I get a stack or two of cards from the new set and actually sit down to play a bit, I’ll post a review– though, that could be after strange eons have long past.